Most of us are likely to experience sore gums at least once in our lives, and the reason behind this can sometimes be bewildering. The fact is that painful gums can be attributed to a number of different factors, and so it can be helpful to know what kind of things to consider if you encounter a problem with your gums. Read on to find out the answers to some of the most common questions surrounding gum pain, regarding the causes, contributing triggers, and ways to treat this complaint. Do Painful Gums Always Mean Gum Disease? Gingivitis – or gum disease in its early stages – exists in around 50% of all adults aged between 30 and 65, and over 70% of those aged over 65. If it goes untreated gingivitis can develop into periodontal disease, which is more likely to cause bleeding and pain in the gums. While this condition is unfortunately considerably common, it is not always the reason behind gum pain. In fact, many sufferers of gum disease do not experience any pain at all – which is the reason why it can easily go undetected and progress to periodontal disease. Could Painful Gums Be Due to an Allergy? 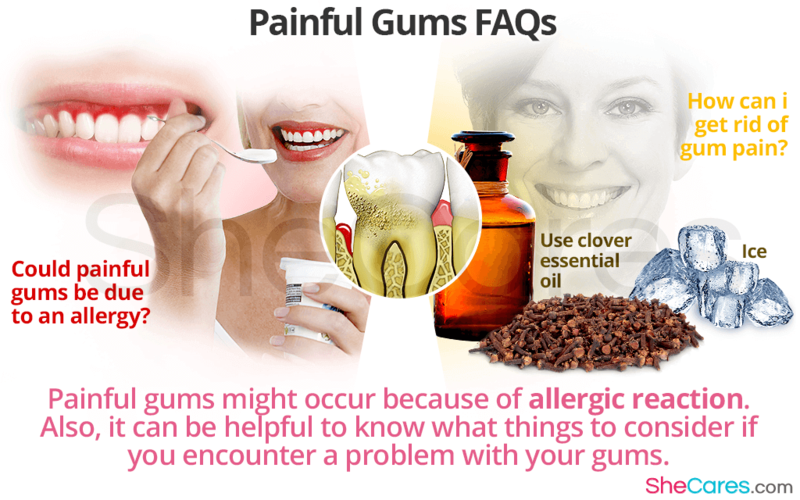 It is possible for painful gums to occur because of an allergic reaction. This might be to a food or drink, or it could be a reaction to some oral hygiene products – although the latter instance is considerably rare. If you consume something that you are allergic to, your body mistakes the material for a harmful substance, and reacts quickly to try to dispel it. This can sometimes lead to swelling in the mouth, including the walls, tongue, and gums. Even after the symptoms have become relieved, your mouth can remain somewhat sore. Can My Diet Cause Painful Gums? A healthy, balanced diet is important for many reasons, and your body is likely to suffer in different ways if it does not receive an adequate amount from each food group. Vitamin C is particularly important for oral health, because if you have a deficiency in this vitamin your bodily tissues will become weaker and more vulnerable to bacteria. This means that your gums become particularly susceptible to problems because this skin is already considerably thin, and your mouth inevitably encounters a large amount of bacteria every day. How Can I Get Rid of Gum Pain? Gum pain can be usually be alleviated quickly by applying an ice cold gauze to the affected area. This should soothe any inflammation, provide pain relief by numbing the gum, and also stop any bleeding should this be necessary. Alternatively – or indeed additionally – many women find that a few drops of essential clove oil can mitigate pain. Compounds within this oil can numb the area, as well as deter bacteria because of its antibacterial properties. Are Gums More Sensitive at Different Stages of Life? The hormonal interactions throughout a woman's life can also have an impact on oral condition. Specifically during puberty, menstruation, pregnancy, menopause, and while using oral contraceptives, contracting gum disease becomes more likely. This is because the hormone levels fluctuate and affect the supply of blood to body tissue, which can cause the gums to be more vulnerable to infections and therefore pain. Sore gums can occur for a range of reasons, and often gum infection pain can be recognized because it happens in conjunction with swelling and sometimes bleeding. Awareness of some of the reasons why you might experience gum pain can be useful to allow you become better equipped in treating it, or ideally avoiding it altogether.